Dr. Hordge-Freeman joined the Sociology department with a joint appointment in the Institute for the Study of Latin America & the Caribbean in August 2012. 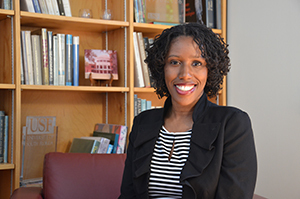 Her primary research focuses on how racial and gender hierarchies shape family dynamics in Black families in Brazil and across the African Diaspora. Her other areas of interest include social psychology, colorism, gender, Diaspora theory, and emotions. Her first book, The Color of Love: Racial Features, Stigma, and Socialization in Black Brazilian Families, is forthcoming in October 2015 with the University of Texas Press. Her work has been published in the Journal of Marriage and Family, Ethnic & Racial Studies, and other academic outlets. She is also co-editor of a volume with Dr. Gladys Mitchell-Walthour, which is currently under contract with Palgrave entitled, Race and the Politics of Knowledge Production: Diaspora and Black Transnational Scholarship in the USA and Brazil. Her newest book project “Second Class Daughters: Informal Adoptions as Neo-Slavery in Brazil” addresses modern slavery and has been funded by a Fulbright U.S. Scholar grant, Ruth Landes Memorial Research Fund, and the American Sociological Association Funds for the Advancement of the Discipline. Dr. Hordge-Freeman is also Director of the USF in Brazil Program and organized the inaugural USF in Salvador, Bahia, Brazil program in summer 2013. She took a second group of students to Brazil in 2014. Hordge-Freeman enjoys teaching courses in Racial & Ethnic Relations, Sociology of Family, Contemporary Brazil, and Afro-Latin America. In 2014, she was awarded two university-level awards for teaching excellence.